Does you have a need to time different events? Do you need to record time measurements on a computer? Would you like to use Excel to analyze your measurement data? We took some ideas from out Pinewood Derby stopwatch timer and combined them with laser technology to create Event Timer Pro (ETP). 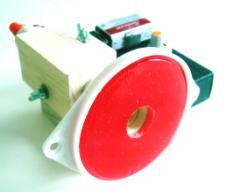 The ETP system uses the same tried and proven circuitry as the Pinewood Derby Timer system. The big difference with ETP is in the sensors. The ETP sensors make use of laser technology. Readily available laser pointers provide the laser light. In both systems we use the Excel spreadsheet program to store information. You must have a copy of Microsoft Excel to make full use of this product. The use of Excel provides a real advantage because many people already know how to use this powerful program. Excel has sophisticated data analysis and charting capabilities that will allow you to easily save, print and analyze your time measurement data. The laser pointer creates a laser light beam that is detected by the Electronics Detection Circuitry. This visible light beam can easily travel twenty or thirty meters (100 feet). In operation whenever an object comes between the laser pointer’s light beam and the electronics detection circuitry, the laser light beam gets broken and the electronics detection circuitry notifies the computer. This action could start or stop a timer running on the computer. 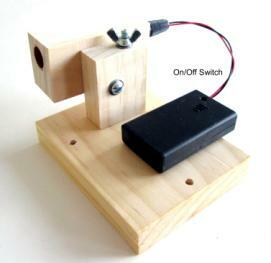 Each laser pointer comes mounted on its own adjustable bracket. The laser beam is narrow and focused and must be adjusted so that it shines precisely on a photo-sensor in the Electronics Detection Circuitry (EDC). This adjustment becomes increasingly more difficult as the distance between the laser and photo-sensor increases. To aid in making this adjustment, there is a led indicator on the EDC board (for each laser pointer). The respective EDC led is normally on and goes out when the associated laser beam is correctly positioned and shining on its photo-sensor. 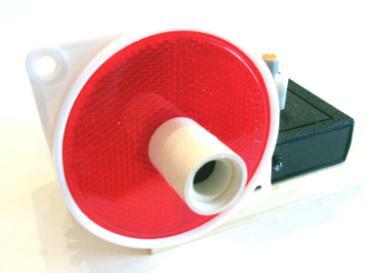 Shown below are pictures of the laser pointer mounted on its bracket. Loosening the wing nuts makes positioning adjustments possible. You can see the battery pack. Pictured below that is the photo-sensor mounted on its adjustable bracket. The same type of adjustable bracket is used for both. In the bright sunlight we found that it was difficult to see the red laser beam so we added a reflector to our photo-sensor unit (see below). We also drilled a hole in the center of the reflector. This allows the laser beam to be easily seen and exactly positioned too. The sensor circuitry also includes a sensitivity control. This helps in the bright sunlight. We also provide UV filters to make the system work better in bright sunlight. The filter is shown to the right. It fits on the end of the sensor tube. It can remain there with the reflector. It is a UV filter and helps to filter out bright sunlight from striking the sensor. Since the laser pointers are all powered by a low-voltage power supply this would make an ideal system for many different indoor/outdoor events (like swimming) since there is no danger of electric shock. The laser needs 4.5-volts that comes from a battery pack (3 AAA cells). 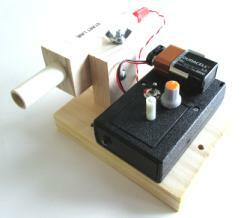 Each photo-sensor is also battery powered using a 9-volt battery. The photo-sensor(s) have a wireless connection with the computer. This completely eliminates any danger of electric shock since there is no direct electrical connection with the computer. There can be up to six laser / photo-senor pairs working at once with the ETP system. The computer interface box is shown below. It contains the radio transmitter and also the USB connection to the computer. The box is powered from the USB port. You must have Microsoft Excel running on the computer along with a suitable spreadsheet loaded. (Several sample spreadsheets are included with the software.) You can easily modify the design of the spreadsheet to suit your particular needs. The ETP software is then loaded and communications established with Excel and the external Electronics Detection Circuitry (Wireless Photo-Sensors). The ETP timer is started at the start of the race/event. The timer is accurate to 0.1 milliseconds. The timer will advance until all the laser beams have been broken. If a laser beam is located at the finish line then a person crossing the finish line will break the light beam and cause his time to be recorded. When everyone has crossed the finish line the time(s) can be transferred to the Excel spreadsheet. You can also monitor two events with two laser pointers and measure the speed of an object, such as the car pictured to the right. In the diagram, a distance of 10 feet separates two laser beams. The time it takes for the car to travel between the two laser beams can be divided into the 10-foot distance. This would give the velocity in feet / second. Baseball bat – swing speed measurement. We are now offering a wireless version that can transmit 300 feet (100 meters). The connection to the computer and each of the laser/sensor pairs would be wireless. Locating the computer receiver in between the sensors could increase the distance. Normally the transmission distance would be line of sight 300 feet. The Event Timer Pro unit can support six laser/photo-sensor pairs. The Complete Starter Set comes with two laser/photo-sensor pairs. Additional laser/photo-sensor pairs must be ordered separately. Event Timer Pro Wireless system (Complete Starter System). The starter system includes computer timer software, computer interface box, sample worksheets, two laser/photo-sensor pairs (wireless). Laser and photo-sensor pair. 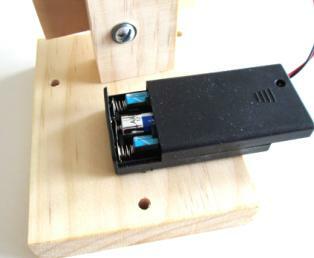 Both the laser and the photo-sensor are mounted on adjustable brackets. Shipping and handling is 10% of order total. We only collect sales tax for Pennsylvania. If your state requires you to pay sales tax then you must pay it yourself. NOTE: You must provide your own copy of MS Excel to make full use of this product. We welcome any questions that you may have concerning this product. 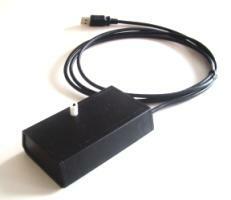 A wired ETP system is also available. Please contact us. It is our policy to continuously improve our products to better satisfy the needs of our customers and to deliver quality products, every time and on time. Computer Products for Education reserves the right to make changes in product specifications and appearance.